1) Remember you do not get extra marks for writing more than 150 words, but you will lose marks if you write less. 2) ‘Others’ is sometimes mentioned as a category on charts. Don’t ignore it. Decide what it is referring to – in the chart above it refers to other companies – and then include the information if you think it is relevant. The bar chart shows the estimated sales of jeans in thousands of pairs for two companies in Turkey next year. It is anticipated that purchases of jeans at Mango Co. will rise from 150,000 pairs in January to approximately 500,000 pairs in August, and will remain there until November. For December, sales are expected to be in the region of 600,000 pairs. Meanwhile, it is estimated that the sales of jeans for Jack & Jones Co. will begin the year at around 450,000 pairs in January, falling to about 250,000, before increasing to around 400,000 in June. For the next two months until August, sales are forecast to remain steady at this level, after which they are expected to rise steadily to hit a peak of approximately 900,000 pairs in December. The pie chart shows that, at the end of next year, the anticipated market share for Mango Co. and Jack & Jones Co. is 20% and 30% respectively. As can be seen from the chart, the overall sales trends for both companies are forecast to be upwards. 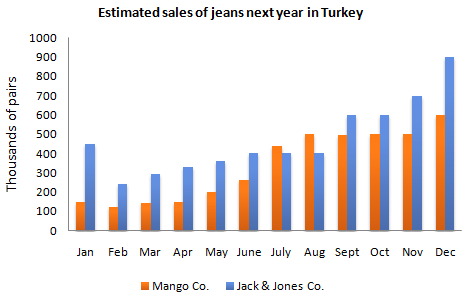 The bar chart shows the predicted sales of jeans in thousands of pairs for two companies in Turkey; Mango Co. and Jack & Jones Co. for next year. The most striking feature is that sales will increase for both companies, It is anticipated that sales of Jack & Jones Co. will start at 450,000 pairs in January decreasing by 200,000 pairs following month with a gradual recover over the subsequent four months reaching 400,000 pairs in June. Those of Jack & Jones Co. are predicted to be stable until August peaking up to 600,000 pairs in September and October. 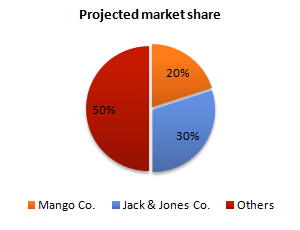 Regarding the pie chart the sales of Jack & Jones Co. will share 30% of market whereas those of Mango Co. 20%. 50% of market is set to be shared by other companies.